Most of the background radiation dose we receive in the UK is from natural sources (about half is inhaled as radon gas). About 15% of our annual dose comes from human activities such as X-rays in hospital or at the dentist or emissions from nuclear establishments. Thus the figure on the right is for 'Mr. Average in the UK'. Such data is worked out using the radiation doses received by a lot of people living and working in a lot of different locations. Some radiation sources are natural but human activities also raise the background count we are exposed to. whether you smoke or not (cigarette smoke is known to contain dangerous alpha emitters). The activity from background radiation is called the background rate. 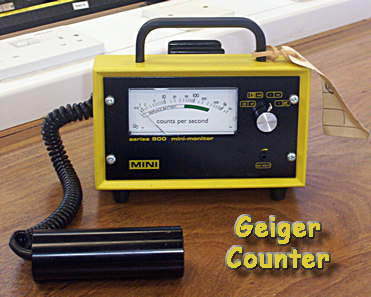 If a Geiger-counter is switched on in a room it will register ionising radiation. This will vary according to location. Before an experiment with a radioactive source is carried out the background rate must be established. This is done by switching on the Geiger-counter when the source is not present and recording the average activity for twenty minutes or so. This value must then be deducted from any readings taken with the source present so that the true activity of the sample can be found.